To ensure the proper performance of a lens system, all lenses must be accurately centered with respect to the optical axis. The level of accuracy depends on the intended application. Even a relatively small centering error influences the image quality of an objective in a serious way. Such errors can rapidly multiply in a lens system and lead to alignment issues and nonsymmetrical aberrations. Constant demands on improved image quality have resulted in a continuous improvement of centering process and its measurement. Centration tolerance is very sensitive to control in meniscus shape lenses as both the radii of curvature lie on the same side of lens surface. Meniscus shape lenses are generally used to control spherical aberration and commonly used in thermal imaging system. In this work we have shown a method for controlling and high precision measurement of centering error in reflection mode as infrared materials such as silicon, germanium etc are non transparent to visible light so transmission methods are not applicable for centering error measurement using the visible light source. © Anita Publication. All rights reserved. Keywords: Deep curvature meniscus lens, centering error, Infrared Lens. We report the effect of tunable wavelengths obtained from femto seconds laser on low temperature gallinium arseide (LT-GaAs) based dipole types Photo conductive (PC) antennas with gap of 5 micron for the generation of terahertz (THz) signals. Two sets of PC antennas (having similar design and substrate material) marked as LT1 and LT2 are subjected to 140 femto seconds laser pulses at 80 MHz frequency of different power, biasing voltages and tunable wavelengths to evaluate their THz generation efficiency. The generated THz power is measured by low noised pyroelecric detector. The femto seconds laser is tuned between 700-1000 nm range to access the effect of photo-generative charge carriers. On comparison, we observed that LT1 generate 294 nW at 865 nm whereas LT2 produces 186.7 nW at 880 nm. The THz frequency spectrum range of LT-GaAs is extended upto 4.0 THz range. Generated THz radiation is also used to record the absorption of the paper of different thickness at 0.5 THz range. © Anita Publications. All rights reserved. We present the design and fabrication of binary phase-only Computer Generated Hologram (CGH) to generate a pattern in the far-field. The design method based on iterative Fourier transform algorithm is described. The CGH of about 10 mm × 10 mm size with 10µm × 10 µm cell size is realized in Photoresist using a maskless lithography system. The replication of fabricated CGH using soft-lithography technique is also discussed. © Anita Publications. All rights reserved. Due to very small in dimensions micro lens array are fabricated using very specialized techniques and the physical and optical parameters of micro lenses like shape, radius of curvature, focal length, surface quality, as well as optical performance plays very important role in performance of those lenses. Present work focuses on the evaluation and characterization of micro lenses in terms of their physical and optical parameters. A setup is rigged up for the measurement of very short focal length (less than 10 mm) and implemented to micro lens. The microlens array was further evaluated for surface profile with aberration analysis and MTF. © Anita Publications. All rights reserved. Any ordinary optical beam of light spreads as it travels due to diffraction of light. Quite recently, non spreading freely accelerating Airy beams have been realized in optics community. In this paper, we have reported Airy beam as diffraction free beam, which consists of two important properties viz freely acceleration and nonspreading. We have carried out simulation study for both 1-D and 2-D Airy beam propagation respectively. We have also made comparison among Airy beam, Bessel beam and Gaussian beam and our results infer that Airy beam propagates diffraction freely for a long distance in parabolic trajectory. While Bessel beam is less diffraction free and travels along linear axis. © Anita Publications. All rights reserved. Keywords: diffraction, propagation, Airy beam, Bessel beams, Gaussian beams. Zinc oxide nanoparticles of size 300 nm were prepared using polyol method. These particles were dispersed in Rhodamine 6G solution and random lasing was then observed from this solution. When the scatterer concentration was varied an optimum particle density value range was observed below which no lasing occurred. The transition from Non-Resonant Feedback lasing to Resonant Feedback lasing was clearly observed. © Anita Publications. All rights reserved. Keywords: Random Lasing, Coherent Backscattering, Nanoparticle. InN is a promising material for optoelectronic devices. The macroscopic polarization is a unique and peculiar property which affects optical and thermal properties of InN. Our theoretical calculation shows that polarization mechanism enhances the thermal property of InN. We estimated elastic constant, Debye temperatue and the thermal conductivity of InN. Analysis shows that these parameters are significantly enhanced by the polarization effect. The revised thermal conductivity at room temperature is found to be increased by 18% in InN. The result can be used for simulation of heat energy in the active region of InN optoelectronic devices to minimize the self heating. © Anita Publications. All rights reserved. Keywords: Wurtzite InN, Macroscopic polarization, Thermal properties. We have synthesized CdSe nanoparticles with particle sizes in the range 4.6–5.2 nm through aqueous method using reflux process. The absorption spectra clearly show a tunable change in absorption edge from 430-510 nm. Sharp excitonic peaks in the spectra indicate monodispersion of the CdSe nanoparticles. Red-shift in emission peak arises due to the increase in size of the nanoparticles, as the reflux time is increased. Energy band gap of the nanoparticles shows a variation from 2.52 -2.35 eV as the particle size increased. ©Anita Publication. All rights reserved. An interferometric fiber optic accelerometer based on Fiber Bragg grating (FBG) is designed and simulated. An L-shaped cantilever and Mach-Zehnder interferometer (MZI) is used to convert acceleration induced wavelength shift into phase variation. Simulation is carried out to find sensitivity, range of the preferred configuration. Acceleration sensitivity of the order of 2.0 µg is reported. © Anita Publications. All rights reserved. Potassium Titanyl Phosphate (KTP) crystals are widely used in optical parametric oscillators (OPO) because of their high effective non-linear coefficient, good thermal conductivity, exceptionally large temperature bandwidth and high optical damage threshold. Despite these advantages, KTP has certain limitations like beam walk-off and gray-tracking which limit its performance in an OPO. To overcome these limitations, crystals developed with new techniques viz. adhesive-free bonded KTP that has negligible beam walk-off characteristics and high gray track resistant (HGTR) KTP have been studied and used to design an OPO cavity. We present here the experimental results of a degenerate OPO using HGTR KTP that generates 2.1 µm output. An average output power of 8 W at 10 KHz has been achieved that includes both signal as well as idler powers near degeneracy using 20 W average power from a 1.064 µm pump source. The optical to optical conversion efficiency of the OPO is nearly 38%. © Anita Publications. All rights reserved. The design and optimization of a optical phase shifter at 1.55µm using Beam Propagation Method is proposed. The idea is to generate a differential phase shift using straight waveguides and S-bend waveguides. The paper discusses the design of integrated optic (IO) elements of the Phase shifter block. The optimized parameters could be used in the practical realization of the device. Phase shifts obtained are validated using interferometric technique. The modulated RF signal obtains the phase shift in the optical domain which is transferred to the RF signal by heterodyning techniques. ©Anita Publications. All rights reserved. Keywords: Integrated optics, Bent waveguides, Heterodyning. 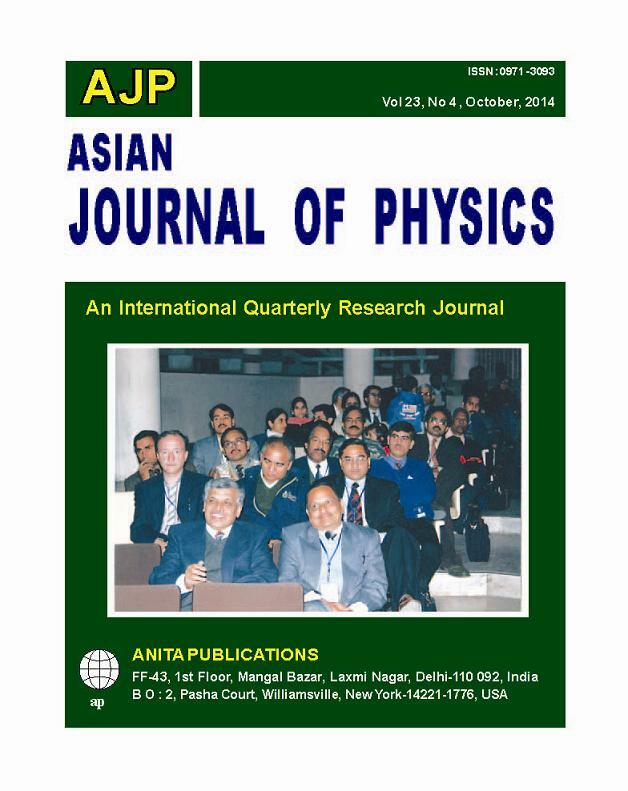 The paper aims at design of integrated optical Micro Ring Resonator (MRR). The ring resonator would normally be designed with the single mode condition, and its dimensions, but this paper mainly concentrates upon designing ring resonator for multimode condition that is obtained by breaking the single mode condition which is already available. The multimodal condition will result in many resonating frequencies (or wavelength) because the basic higher order modes will be guided through the core. The band of frequencies obtained can be utilized for WDM applications also. © Anita Publications. All rights reserved. The Mach Zehnder Interferometer (MZI) modulator has wide acceptance in optical communication systems because of its advantages like lower chirp, high output power and the capacity to handle high power. The advancement in Microwave photonics made possible the transmission of high frequency signals over fiber links. These applications require sources with external modulation capability like in MZI modulators. This work brings out some of the analysis carried out on MZI modulators with various high frequency waveforms like Continuous wave (CW), Pulsed CW, Linear Frequency Modulated (LFM) and Non-Linear Frequency Modulated (NLFM) waveforms. Thus the paper describes about both mathematical and co-simulation model to have a better comparison. Further, accuracy of the model is verified with experimental results using a WDM link. The results observed were in compliance with developed model results. The model is also evaluated with variations in different parameters like input power, input dc bias voltage and modulator full swing voltage. Thus the paper includes analysis results of above observations. © Anita Publications. All rights reserved.